Mahaa Kali Yantra is a very powerful Yantra, and is for the worship of Goddess Kali. This Yantra has occult powers & it's worship reverses the ill-effects of black magic, and protects a person from the bad influences of spirits & ghosts. This Yantra also eliminates the harmful effects of malefic planets, especially Saturn, which are usually responsible for misfortunes, sufferings and sorrows in life. 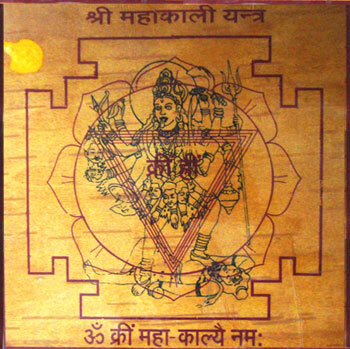 Kali Yantra bestows spiritual power, and results in fulfillment of desires, increase in wealth and comforts of life. This Yantra is also a time-tested remedy against chronic diseases like blood pressure, paralysis and nervous disorders. 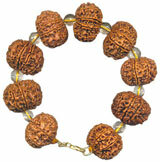 It also bestows longevity to the person who wears this Yantra on his body. Mahakali Yantra is very powerful and tested Yantra.One should keep the image of Kali while performing puja on it. 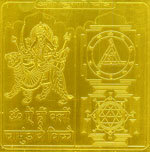 According to Swangam Tantra, Kali Tantra and Bhairo Tantra this Yantra is known as swanam Yantra, kali Yantra, Mahakali Yantra or Bhadra Kali Yantra. 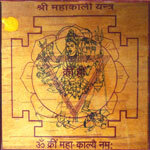 Goddess Kali in a fierce pose is deity of this Yantra. This Yantra is composed of a Central Point (bindu) within five inverted traingles, three circles, eight petals inside and outsides, whole Yantra enclosed in four doors, is written on rarely available Bhoj Patra. Special pooja of this Yantra is performed on Eighth day of Chaitra, Asar, Sharavan, Magh,& Ashwin Months of Vikrami year. The worship of this yantra is performed in a specialised way. 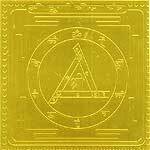 This Yantra bestows fulfillment of desires, wealth, comforts of life and is used for Mohan, Vashikaran purposes and protection as well. 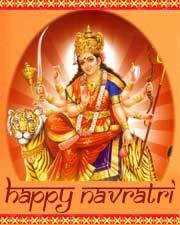 Lot of power is infused after Pooja and Yantra is capable of controlling enemies not to do any harm. A unique and powerful yantra. International Shipping within 4 working days.